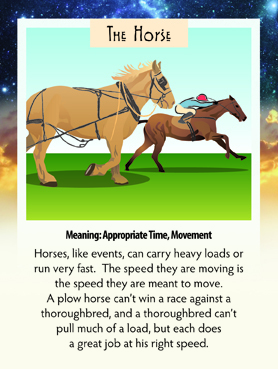 I look at that card and I see the plowhorse, going at a nice steady pace. Yes, that racehorse is doing what it wants to do, but it must be that I’m identifying to a slower pace this month. Thanks for reminding me Robbie that it’s all right to do so and to want to do so. I, like everyone else, forget the natural ebb and flow of fast and slow and think that we have to do a certain amount of “productivity” each and every day.